The Amish Double Door Picture Frame Curio Cabinet provides all the room you need for your treasured collections. Bring precious keepsakes up from the basement and enjoy the memories they represent showcased in this beautiful Amish display case. This grand solid wood curio cabinet complements the decor of your dining room, living room or foyer with ease. Customize this Amish curio cabinet with the solid wood and stain you love. Consider up to two additional shelves for additional items. 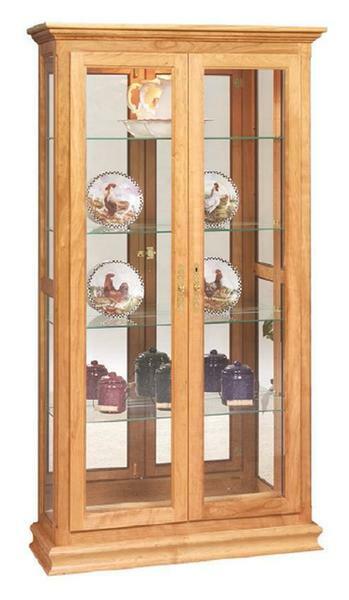 Review our collection of Amish Curio Display Case Cabinets to see all the styles we have to offer. Take a look at our blog post, "Curio Cabinet of Curiosities," to learn more about curio cabinet styles and features. Call us anytime, toll-free at 866-272-6773 with questions.